A few miles north of Mayfield, Kentucky, there sits a wasteland of steel-beam buildings and cracking concrete. The site is the former home of Continental Tire, a manufacturing facility once outfitted with the latest tools to produce car and truck vehicle tires. In its heyday it was home to more than 2,000 workers, drawing its labor pool from across west Kentucky and northwest Tennessee. After years of slowly declining, in early 2007, the plant shuttered its doors and said goodbye to the final 150 employees. Today, more than eight years after the closure of plant, the leaders of Graves County, Kentucky, are working hard to replace lost jobs and secure the economic prosperity of the region. A key technology helping local leaders recruit new industries is fiber optic-based telecommunications. The broadband services provided by West Kentucky and Tennessee Telecommunications Cooperative (WK&T) are giving local leaders the upper hand to help attract new investments. And despite its rural nature, Graves County is finding itself on a level playing field with much larger metropolitan areas thanks to the power of fiber. For one product — air compressors — the business epicenter has always been Graves County. Fiber is not only helping to keep this business sector local, but it’s also providing the ability to grow operations and increase efficiency. Silicon Valley, not Calloway County, Kentucky, has long been the central hub for technology jobs. From the birth of Apple Computer, the height of the dot-com era and today’s fast-paced mobile application development, California has been home to the some of the largest technology firms in the world. But a high-speed fiber Internet connection from providers like WK&T is changing the landscape of where technical jobs can be located. “These technical jobs can be done from anywhere now,” says Rick Murdock, co-owner of Ag Connections, a company providing software solutions to the farming industry. The Ag Connections software, which growers pay a yearly license fee to use, provides farmers with production record keeping, cost analysis, regulatory compliance records and data sharing within their system. The computer program, which can be accessed on Web browsers and mobile devices, gives farmers the ability to truly know their costs, keep track of their inventory and minimize mistakes. 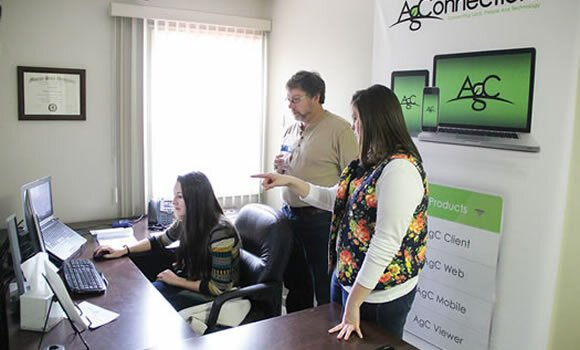 Rather than travel to a grower’s farm to help them with their system, Ag Connections support specialists are able to essentially take over a growers computer with a fiber connection and walk them through the issue. In rural Kentucky, with unemployment numbers at 9.2 percent and 8 percent in 2013 for Graves County and Calloway County, respectively, partnerships like the one between Ag Connections and WK&T have given people the opportunity to find great jobs locally — jobs that could have easily moved to Paducah or Nashville. Thanks to the presence of fiber, Ag Connections’ success is helping the community prosper. “Without the bandwidth from WK&T, we would have had to move off this country road a long time ago,” says Murdock. The ability to operate from Calloway County allows Ag Connections to provide jobs for local residents. “This is home, this is where they go to church. They want to be here, and it makes us a stronger company,” says owner Rick Murdock.